"Okay. I'm off to do my homework," I huffed reluctantly, sparking my headlight as I turned away from the campfire, darting into the tent before the mosquitos could join. 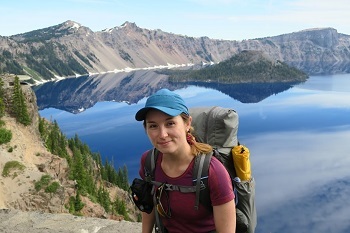 It was day 62 of living in the wild, deep within Washington State's Glacier Peak Wilderness. Beyond the nylon shelter, the sound of an icy-cold creek crashing off the ridge above pierced an otherwise ghostly grove of old-growth firs. The dense smell of trees coated in moss, damp dirt, and fungi now felt comfortingly familiar. Earlier that day, America's vast wilderness had continued to punish and reward. My husband Conrad and I had tackled 14,000 feet of elevation change. Winding up steep mountain passes, through lush meadows, down tight switch-backs descending into deep green valleys below. We crossed perilous, glacial-fed streams, soaking our t-shirts to fight off the heat. On our backs, helping to make our feet increasingly swollen, were 30-pound mega-packs, which we hoped would contain all the supplies we needed to stay alive. Twenty-three miles of Sound of Music-worthy scenery later, we called it a day. I was exhausted. I felt the same every day. When was it going to get, well, easier? My stomach rumbled with the common pangs of discontent, never fully satisfied. Yet, as tempting as it felt, I couldn't disappoint my future self by failing to record that day’s wanderings. How could I risk forgetting a single moment of what I would later come to recognise as the greatest adventure of my life? Even if I didn't appreciate that part quite yet. The Pacific Crest Trail (PCT) runs the entire length of the United States. It begins at a wire fence designating Mexico, leads 2,650 miles along America’s mountainous western backbone, and arrives at a conifer-lined border with Canada. Each year thousands of hikers secure permits in an attempt to conquer the trail. Many fail to make it the entire way. Yet romantically, these (mostly) young, fit, determined souls approach the trail with fantasies of the impending months away from their real lives, immersed in nature. Conrad and I were not those people. We had both reached our 30s without carrying a fully-loaded backpack, let alone walking more than 10 miles in a single day. We had no idea what we were in for. It was farcical really. But the motivation came from an urge to do something. Life wasn’t working out too great in the hostile corporate world, we needed a time-out, and spurred on by the idea of a challenge we rather randomly decided to walk a 950-mile section through Oregon and Washington. I’ve always hated camping. I feared being in the woods after dark. Our families naturally ran bets over how long - in days - we'd last. Before leaving for America, I created a blog to keep our family posted. I thought of it as a courtesy, enabling them to track who was currently winning in the betting stakes. As much of the trail passes through isolated terrain, I decided to use the WordPress app to draft daily updates on my mobile, adding photos for upload whenever we reached a strong enough signal. Hunched over the tiny phone’s screen each night, fearing that the battery would die, I often cursed myself for making this commitment. But I kept it up, fearing Mum would panic if the updates suddenly stopped. I also loved receiving comments on posts - sometimes from complete strangers providing a sense of connection from afar. I certainly never intended my messy, gramatically challenged blog to be transformed into a book, but after returning home to London I found myself unable to let go. I’d stare at photos for hours knowing the trail was still out there. And with winter drawing in, our surrogate wooded home would soon be covered in impenetrable snow. So far away, I felt compelled to keep it close. To keep its memory alive. The Unlikeliest Backpacker came from my attempt to record the summer’s memories for personal posterity. I never expected anyone else would be interested, let alone want to publish the finished product. From my little flat in Bermondsey I spent long, grey months transporting myself back to a wonderous land of big blue sky and endless horizons. I got to re-live the miles of physical hardship, revel at the epic sights, smile at the memory of the generous people we met along the way, and at the mixture of tantrums and tears (often of laughter) our amateur shenanigans brought to the mountains. No two days on the trail were ever the same. Never had I felt so alive. New to writing, I found the process a perfect tonic for the winter blues, "cathartic" as they say. Though based on the blog, the book is more intimate and personal. With time for reflection, I was able to look deeper, and to show emotion that I felt uncomfortable sharing on social media. The blog was, after all, a heavily sanitised version of events, a version aware of online scrutiny and paranoid about giving too much away in "real time". The book allowed me, somewhat irrationally, to be my most honest self. I could include people and events I dare not blog about - mostly out of concern for my Mum - and without the heavy use of photographs beside the text, I was charged with bringing the trail to life by sparking readers' imaginations. Back in the tent, by the time I finish chronicling the day's absurd ramblings Conrad is snoring besides me. I steal a moment to honour our achievement (we’re still alive after all), before deciding to add another pair of socks to fight off the frigid August air. 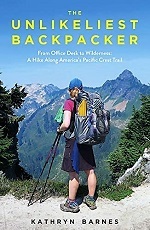 The Unlikeliest Backpacker by Kathryn Barnes is published by Hornet Books.